Ridership of transportation network companies (TNCs) like Uber and Lyft is increasing, and that’s posing new challenges when it comes to airport parking. TNC use at some large airports is in the range of 15 percent to 20 percent of all passengers to and from the airport. As patrons choose TNCs to travel to and from airports, demand for parking and other ground transportation options is falling, resulting in lower airport revenue. The problem is, parking is a significant source of revenue for airports—for many it’s the second most important revenue source after gate fees—so falling parking demand can hit an airport’s bottom line hard. So, how can airports respond in this Age of Uber? The impacts on parking are not uniform across parking products, and range widely between different airports. However, modeling parking finances can help airports find the right fee to charge for TNC trips to help recover lost revenue. The potential impact of TNCs on airport parking are more complicated than simply assuming there’s a uniform decrease in parking demand across the airport parking system. Airport parking demand increases with rising originating enplanements, which in some cases is going up at 3 percent to 5 percent annually. So, while the per passenger parking demand is going down because of TNC use, the number of passengers is growing. This leads to mixed financial results for airports based on several factors, including parking fee changes. In some cases, revenues are flat as enplanements are increasing. Each airport experiences different changes and every situation requires specific solutions. For example, a TNC modeling study at one southern airport found that total parking demand in 2015 dropped by 3-5 percent, compared to 2014, because of TNC trips. This displacement was predominantly affecting longer-term parking of three to four or more days in duration. Conversely, a survey for another southern airport found that TNC trips increased by 600 percent (on a per enplanement basis) from 2014 to 2016. Meanwhile, the total parking transactions per enplanement decreased by 11 percent from 2014 to 2016. In this second case, long-term and remote parking grew, while short-term parking clearly declined. One potential reason for this difference is that patrons could be using TNCs (which never park) rather than being picked-up or dropped-off with a personal vehicle (which occupy short- term parking). The drastically different findings from these two engagements demonstrate the complicated nature of TNCs’ influence on parking demand within airports. TNCs are also impacting airport car rental revenues and taxi utilization fees, which are also declining as many passengers forgo a taxi ride for a TNC ride. For example, Las Vegas’ McCarran International Airport experienced a doubling of TNC pick-ups and drop-offs from a year ago, but saw taxi pickups decline by 13 percent. Los Angeles International Airport, on the other hand, began charging for TNC rides in 2016, which added nearly $9 million in revenue, while rental car revenue on a per enplanement basis fell by nearly 12 percent in the same year. TNCs are causing revenue losses through declines in parking and other ground transportation demand, which left unaddressed, may continue to decline as TNC ridership grows. In light of these issues, virtually all major airports have begun charging a fee to TNC rides, similar to fees charged to taxi rides, either to or from the airport, or for both directions, using geo-fencing technology. Additionally, airports frequently charge a one-time or annual fee to the TNCs, similar to that of airlines, car rental, and taxi company fees. However, revenues generated from per-trip fees to riders tend to dwarf these one-time fees, which are currently relatively low. 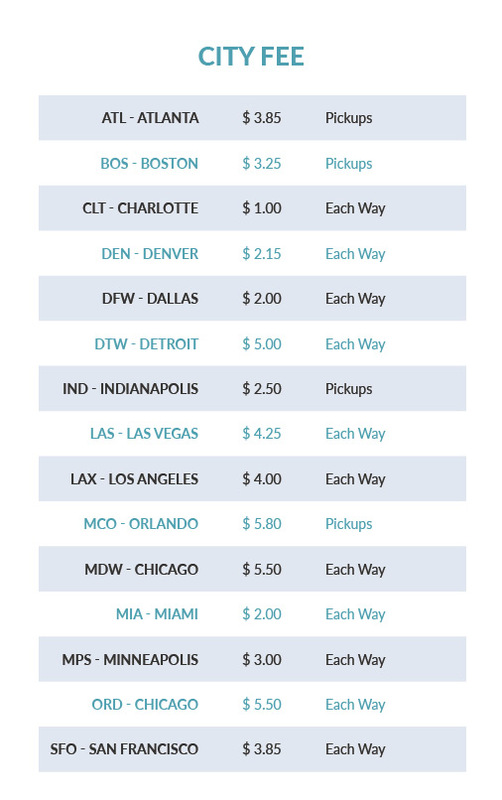 Current TNC fees at many major airports in the US are presented in the above table. Each airport’s needs for TNC fees will likely be different and when setting a fee airports need to take into account the nature and volume of the population surrounding the airport. The volume of TNC rides to and from the airport, current parking demand and fees, and other ground transportation operations revenue all affect TNC fees. Additionally, these issues may change over time, as TNC ridership grows, so airports need to regularly reassess their fees. Despite the increased use of TNCs, not all airports have experienced parking revenue loss. The stability of total parking revenue at these airports may be attributed to a combination of increasing originating enplanements and/or increased parking fees; many airports increased parking fees to offset a decline in demand. However, this approach could reach a threshold where the cost of a TNC trip is low enough relative to the cost of parking that patrons choose to use TNCs at even higher volumes, assuming today’s TNC trip prices don’t increase significantly. Airports continue to monitor the parking revenue situation and must continually monitor their parking products to keep up. As time passes, airports will increasingly need to consider parking technology to make the parking experience more convenient and pleasant or institute parking loyalty programs offering discounted parking, reserved parking, special deals with terminal vendors, and other perks. These offerings appeal to travelers who might otherwise turn to TNCs by making the parking experience more convenient and rewarding. Transportation networking companies already play an important role at America’s airports, and that role will continue to grow. As most airport executives have already discovered, TNCs can have a significant impact on the bottom line, particularly when it comes to parking revenues. On the positive side, TNC use may forestall or eliminate the need to expand parking at some airports. It is essential for airport executives to make parking planning an essential element of their airport’s operations, and that should include constantly evaluating the airport’s parking planning to assure that it accommodates current transportation trends and can adapt to foreseeable changes in the transportation industry. The shared economy, as illustrated by the rise of TNCs is always evolving and airports’ parking planning must also constantly evolve to keep up with the growth of TNCs and the transportation trends that are likely to arrive in the future. As printed in the August/September 2018 issue of Airport Business. Art Stadig, P.E. 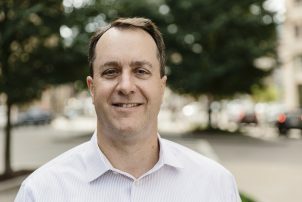 is Vice President and Director of Aviation Services for Walker Consulting, the world’s leading parking design and consulting firm. He can be reached at astadig@walkerconsultants.com.